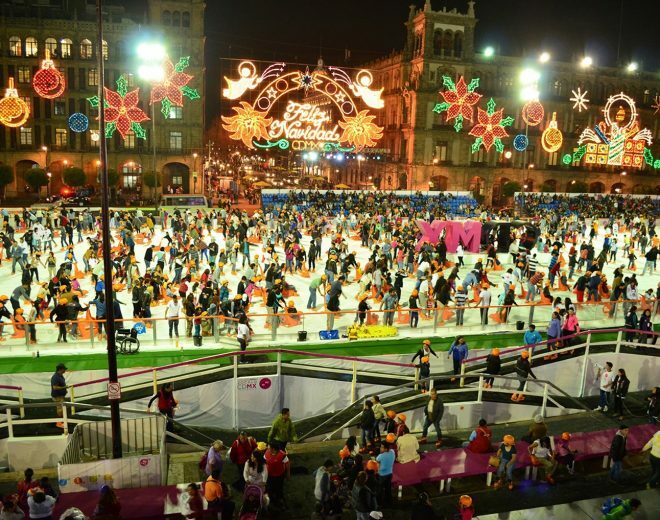 In the sunny metropolis of Mexico City, when you think of ice, you’re probably imagining an ice-cold Corona or a Margherita rather than a skating rink. With its subtropical climate Mexico City doesn’t have cold winters, which means it doesn’t have any skating tradition either. And yet, year after year, an immensely popular Ice Fun Park is set up on the city’s central square. Plaza de la Constitución square – more commonly known as the Zócalo – is one of the biggest squares in the world. When the mayor was looking to do something unique for the people in 2012 he came up with a new vision of an old Christmas tradition on this square. He challenged Ice-World and the local partner Becar to bring to the city something new, innovative and unique. Fortunately, Ice-World came up with a solution and that was how the iconic Zocalo Ice Fun Park was born, based on our patented aluminium system, a skating rink that can be skated on at temperatures of up to 30°C in an open-air atmosphere. This is possible thanks to the “cold finger”, a aluminium element that maintains the top layer of ice at the right temperature, even at higher ambient temperatures. The efficiency of this project can also be seen in the record time in which the skating rink is set up every year: within five days, all three skating rinks are ready for use. It’s a unique piece of technology! The customer had high expectations in advance of that first cooperation with Ice-World: superior ice quality, innovative design, short installation and dismantling times, a professional approach, exclusive accessories and complete dedication. So it was fantastic news when we heard from the customer after the event that we had not just met, but actually exceeded, these expectations and that the cooperation would be repeated for many more years. The design of the skating rinks is changed every year in order to make the event a unique experience each time. The exclusive accessories that are supplied with the installation (like Bobby the Seal®, Tommy the Reindeer® and the IceByks®) mean the skating rink is a pleasure for everyone. Thanks to these accessories, children, people new to skating and those who are not so steady on their feet can nevertheless enjoy a care-free afternoon of skating fun. The Ice Fun Park is not only popular with the locals, and every year the skating rink attracts many foreign tourists to the city. Thanks to the immense press attention, the Ice Fun Park has grown into an international phenomenon: National Geographic even calls the event one of the best skating rinks in the world. As a result of its exceptional size – it is the largest skating rink in the Americas – and its location in the hot climate, the Ice Fun Park is the only one of its kind. We are proud that we can enjoy setting up this major challenge every year and create a fantastic experience for the young and the not so young!